As we all know, the iPhone has limited storage when you purchase one. You have a few storage options, but sometimes your storage can fill up in a hurry. If you’re a commuter or traveler, there might be a time when you’ll want to save of pictures of videos offline for viewing without using your data connection. The OLALA 64GB iDisk iPhone USB3.0 Flash Drive External Storage fits in perfectly, offering you 64GB of expandable storage for around $50 if you’re an Amazon Prime member. The device requires that you install their iDisk Me app, which is actually nicely designed. As soon as you plug the drive into your iPhone, you’ll be prompted to go to the App Store to install the application if it hasn’t been previously installed. Once it is installed, the next time you connect the drive, you’ll be asked to Allow the the app to communicate with the device. Unfortunately, you’ll be prompted to allow this every time you connect due to Apple’s security policies. The OLALA 64GB iDisk iPhone USB3.0 Flash Drive External Storage comes in both Gold and Rose Gold colors to match your iPhone. I reviewed the 64GB Gold model, but there’s also a 128GB available in limited stock. You can organize the media that’s on the iDisk into folders through the app. When you plug it into a computer, there’s no special software needed, so you just have to do what your computer normally does with USB devices. When it comes to performance for the device, I felt it was average. The write speed was decent and I was able to copy a 1Gb video in under a minute. I copied a .m4v and .avi file to it and both videos played back on my iPhone with no buffering or stuttering. To access the files, you have to open the iDisk app. Within the app, you can select different categories such as Photos, Videos, Docs, etc. It did a good job at detecting the file types and only showed the videos when opening the Video tab and showed pictures when opening the Photos tab. The iDisk app also has a built-in meter that shows your iPhone’s disk usage as well as the Flash Drive’s disk usage. 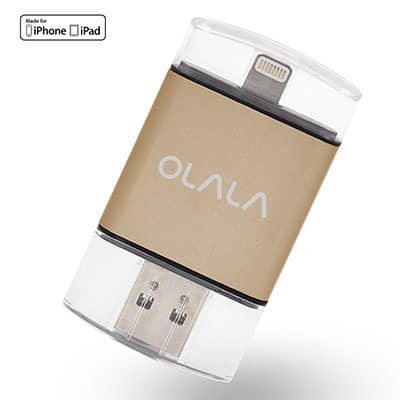 I only have a couple of suggestions for improvements to the OLALA 64GB iDisk iPhone USB3.0 Flash Drive External Storage. For the model I reviews, the protective covers sometimes got slippery and difficult to remove, not to mention the fact that they could easily be lost since they’re small and clear. I believe OLALA has another model that has a slider for the adapters, but the design I reviews allows you to plug it into the computer and phone at the same time. Overall, I think the OLALA 64GB iDisk iPhone USB3.0 Flash Drive External Storage is a very capable device, and for the price it functions very well. It would be a good holiday choice for commuters or those who travel a lot so they could carry some extra movies with them without using up their iPhone’s storage.